The Sea Hawk Motel is family owned and operated with efficiencies and motel rooms. 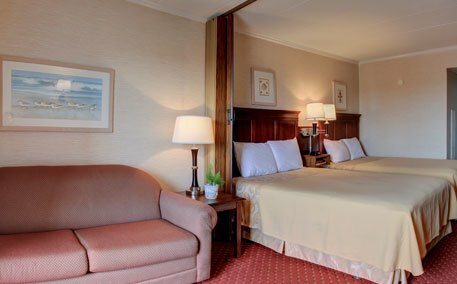 We pride ourselves in providing clean, comfortable accommodations and friendly service to Ocean City visitors for many years. Our apologies, but we do not allow pets to stay at our hotel. We are located in North Ocean City on 124th street, 1/2 block from the beach and located near many restaurants, shopping, Northside Park Recreation Center, miniature golf, entertainment and more. One of the best values. Browse through our website and see why our customers come back year after year. We look forward to seeing you at the beach! All motel rooms are located on the 4th floor and include two Queen Beds and a full sized sleep sofa. There is a room divider between the two queen beds and the sleep sofa. The room also features cable TV with free HBO and Disney, mini fridge, balcony, telephone and private bath. All units are non – smoking. $10 extra person charge per night will apply for additional guests in excess of 2. All efficiency rooms include 2 queen sized beds and a full sleep sofa. There is a room divider between the two queen beds and sleep sofa. 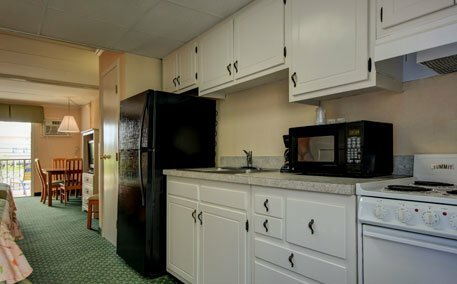 Equipped with a microwave, full-size refrigerator, sink and 4 -burner stove with oven. Linens and kitchen utensils are included, as well as daily maid service. Maid service does not include dishes. This room also features a balcony, private telephone and cable TV with free HBO and Disney. All units are non – smoking. $10 extra person charge per night will apply for additional guests in excess of 2.